The Planet Wealth flagship product is what they like to call "The Amazing Dimitri Strategy". It's all about how to "rent out" shares that you already own, as well as "selling insurance on any market". The Planet Wealth "rent out shares" idea is otherwise known in investor jargon, as Covered Calls. The idea is that you own at least 1,000 shares if you're investing on the Australian Stock Market, or just 100 shares if you choose to own US Stocks. Most people who own shares tend to rely purely on dividends as their income source from these investments. 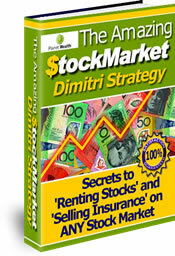 Andrew Dimitri shows you how you can earn extra income by "selling" call options on your shares. By "selling" we really mean "creating out of nothing" or sometimes called "writing" call options. You create the option contract and sell it to the market and receive an immediate income. Easy, but you have to know what traps to avoid, which is where the Dimitri Strategy comes in. But the "main event" on the Planet Wealth menu, is how to "sell insurance" on the stock market over shares that you don't even own. In investor jargon, this strategy is otherwise known as option credit spreads. The "insurance" part is given that name because the primary focus of their material is on writing put options, which are really just another form of insurance on stocks. The principles they outline however, can be used just as effectively for CALL option credit spreads. There are many advantages to option credit spreads which other forms of share market investing don't provide. One of the most attractive features is the ability to adjust your position when the trade goes against you. What would otherwise have been a "losing trade" if you had simply purchased call options and the stock price went against you, can simply be "rolled out" for extra income when you have a credit spread strategy in place. You’ve heard of buying a property and RENTING it out? Did you know you can do a similar thing with stocks? We'll show you how we use latest techniques for "RENTING" OUT OUR STOCKS. The incredibly simple way we make money EVEN when the stock prices go down! ...and even more exciting strategies! By SELLING INSURANCE on the stock market, we make considerable monthly profits on stocks we DON'T EVEN OWN! We NEVER need to own these stocks if we choose not to - we just keep getting income from them. The amazing secret where we don’t even have to pick a stock to trade – we can create income from an entire market at once! How we also insure ourselves so we almost never lose any money - we call it the Sleep-At-Night factor. If you decide to purchase the Planet Wealth downloadable ebook, they also provide you a free "Spreadulator" Excel spreadsheet, which allows you to calculate and monitor your trades using their methods. They also provide one full year of daily put option closing prices, in spreadsheet form, so that you can backtest the strategy and see how you could've made an income even in adverse conditions. Did You Know That You Can Make a Good Living Using Option Credit Spreads? Want to Know the "Nuts and Bolts" of How to Do It? Near Riskless Trading strategies using options, allows you to use advanced arbitrage techniques for highly profitable, almost risk free results. Wealth building options trading - how to profit from share investments even if you buy at the top of the market. Whether you only have a few thousand or a large sum to invest, the Three Legged Box Spread is one of the best option trading strategies available for retail investors today. Copyright © 2002- Options Trading Mastery. ALL RIGHTS RESERVED.